Card-Shark is the renowned specialist for magician's playing cards and stands for highest quality, craftsmanship, German perfection and top notch service worldwide. The Birth of the Phoenix! 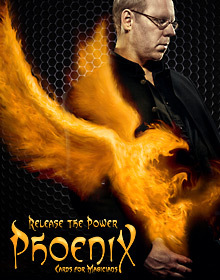 The new era in card magic started in November 2009 by releasing a unique new designed deck of Poker cards, specially made for magicians, called the Phoenix Deck. The Phoenix Deck entirely focuses on the magician's needs, in quality, reliability and availability. All evolutions and revolutions we created since then improved card magic as we knew it, with lots more possibilities and impossibilities. Working together with Top Class Magicians from around the World, we can all improve and rise like the Phoenix. Read more about the Phoenix Deck family here.